Katharina has not yet uploaded a photo of Tocki. Katharina has not yet written a description of Tocki. Tocki has yet to receive opinions from dog sitters on Gudog. 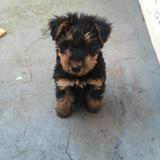 Want a profile for your doggie like Tocki's?